The 'secret information' argument was the last lie of the WMD believers. It was a ridiculous, almost pitiful lie--that somehow the US was not revealing information that would defend its own case. But leading government figures on the WMD issue like Kay fueled this last lie. It was all they had remaining in their arsenal of lies. In short, the WMD lies were not simply for the build-up of for the war, but have continued in the war's aftermath. I dealt with this particular lie in the following manner in my essay on WMD -- "The WMD lies". ON June 27, David Kay, who now leads the CIA team searching for WMD in Iraq, asserted that there are WMD revelations upcoming. And after returning from a fact-finding mission in Iraq on July 3, Republican United States Senators Pat Roberts (Kansas) and John W. Warner (Virginia) claimed that the United States government possesses solid evidence of Iraqi WMD, but is keeping it classified. "When might Mr. Bush make such information public? Perhaps when Democrats have gone too far out onto the antiwar limb to crawl back. Democrats may be racing into an ambush that Mr. Bush will spring at a time of his choosing." This "entrapment" argument seems to misunderstand the fundamentals of epistemology. Obviously, one can only derive conclusions from existing facts, not unknown facts that might be revealed at some future date. All scientific theories could be overturned by the discovery of now unknown facts. Those critics who bring up the missing WMD issue could not be faulted for not knowing facts that the administration has deliberately hidden. Moreover, the idea that the Bush administration possesses solid evidence that it keeps secret while publicly putting forth various flimsy claims that are soon abandoned is simply incomprehensible. It might also be added that the Democratic senators who took part in the same mission as Roberts and Warner said that the WMD evidence was inconclusive. " AN intensive six-month search of Iraq for weapons of mass destruction has failed to discover a single trace of an illegal arsenal, according to accounts of a report circulating in Washington and London. The interim report, compiled by the CIA-led Iraq Survey Group (ISG) of 1,400 weapons experts and support staff, will instead focus on Saddam Hussein's capacity and intentions to build banned weapons. "People should wait. The reports today are speculation about an unfinished draft of an interim re port that has not even been presented yet. And when it comes it will be an interim report. The ISG's work will go on. He added: "Our clear expectation is that this interim report will not reach firm conclusions about Iraq's possession of WMD." 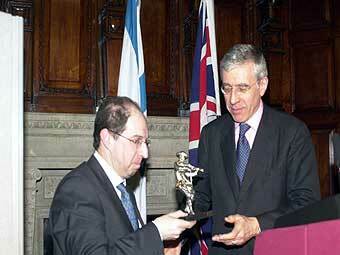 The foreign secretary, Jack Straw, (right), at the United Nations general assembly, declined to comment on the report. "If people want evidence, they don't have to wait for Dr Kay's report. What they can do is look at the volumes of reports from the weapons inspectors going back over a dozen years including the final report from Unmovic on March 7 this year, which set out 29 separate areas of unanswered disarmament questions to Iraq," he said.